Somehow, this crazy idea we had to try and help one horse escalated into helping two, and they are now set safe with fans and ad lib food to help their recovery. It’s heartwarming seeing their body language, their lack of tension, their doing what horses should do – standing relaxed and eating. Just being horses. Miss has clearly suffered a lot of abuse when worked. His legs bear the evidence of hard riding and lack of care. They are still very swollen, but all the TLC and appropriate care being given is ensuring he is on the road to recovery. 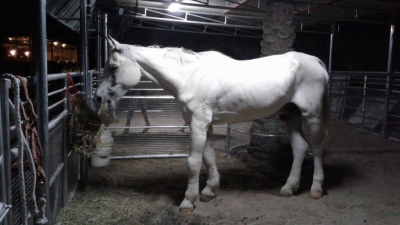 I know we have him safe, I know we have him out of the situation where his lameness was secondary to his life, but it’s chilling that the horse described in his story, the horse below, could be treated so badly that he looks as he now does. That proud and beautiful horse, who gave so much pleasure to so many people. There is a point to this story other than his being moved to safety. He’s a drop in the ocean. 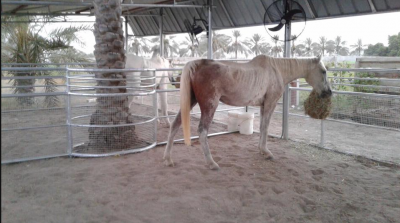 We have seen horses from all over the world in these dealers yards, dropped down the spiral of neglect and disregard, until nobody cares if they eat or drink, live or die. We were powerless to help them, and then we found Miss. We found The Wrong Horse, too. As mentioned previously, Miss’s brand let us identify him. So we did what people have done all his life, we used him too. We used him to show that the retirement homes for all these good horses exported from overseas, are a big fat lie. This horse was in Sheikh Mohammed’s son Fazza’s stable. If he was broken, and no use, why did they not take responsibility for him? Why not have the decency to euthanase? They can’t cry lack of funds, or lack of facilities, but it’s sickeningly obvious that there is no duty of care. So when those held up as shining examples for the sport act like this, there’s little hope of any compassion filtering down the status chain. This is no naive comment, this is not an emotional, chest-beating post. 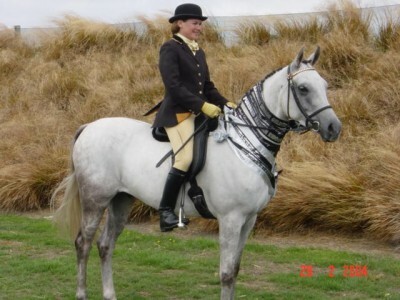 It’s understood that horses are a major part of the leisure and sporting industries, and as such, many will be moved on throughout their lifetimes. They are, by necessity, a commodity, and during the period their individual values are high, there is reasonable hope that their well-being remains catered for. Once their usefulness has gone, however far they fall from glory, they are still sentient, they know suffering. The logistical nightmare that our group went through simply arranging an escape for these two horses showed how enormously difficult it is to remove any of these horses to a secure environment. Until such times as the breeders and dealers outwith Group VII countries stop selling to them, these horses will continue to be disposable and easily replaced. Is Selling Souls really that important?